PONDEROSA RANCH RESORT is located 15 minutes from Cornwall and offers a Cottage rental on 35 acres estate. For your holiday rental and your vacation retreat, this property is ideal for the family getaway and can accommodate a group of 10 people. 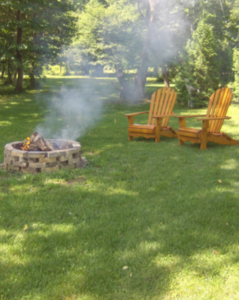 We offer outdoor games, kayaks, paddle boat, canoe, wood for the fire pit, nature trail, BBQ with propane,or you can just relax on the deck, we have a barrel sauna for the winter months and wood for the wood stove. We have a dock for your boat or you can just fish, we also have a launch for the kayak, a play center for the children. The Cottage is away from other building giving you privacy and the feel you are in the Laurentian. We are 5 minutes from the golf course and at the doorstep of the waterway bike trail. We are 1 hour and 15 minutes from Ottawa and Montreal. Come and enjoy the experience for yourself. At the Ponderosa Ranch. We also offer the property to host outdoor weddings for that courtyard feel. Coming soon, our own chipping green for you to practice on before you head out to the golf course. We had a wonderful time at your place, quiet, lots to do for the grand kids. Got a kick out of the canoe rides, wild life. Very relaxing & time well spent. The accommodations are great... Sorry we had to leave. See you next year. I'd rate my overall experience at the property as Excellent. The experience that was had at the Ponderosa Ranch will be memories that will last a life time.